It must be unprecedented for publication of a scientific research paper to make a big impact on a significant sector of the stock market. But, in these days of ‘spin-off’ companies and the promise of unimaginable riches from the application of molecular biology to every facet of medicine and biology, perhaps it was only a matter of time. Well, the time came with a bang this June when the journal Nature Medicine published two papers from different groups describing essentially the same findings. Result: three companies (CRISPR Therapeutics, Editas Medicine and Intellia) lost about 10% of their stock market value. I should say that a former student of mine, Anthony Davies, who runs the Californian company Dark Horse Consulting Inc., mentioned these papers to me before I’d spotted them. What on earth had they found that so scared the punters? Well, they’d looked in some detail at CRISPR/Cas9, a method for specifically altering genes within organisms (that we described in Re-writing the Manual of Life). Over the last five years it’s become the most widely used form of gene editing (see, e.g., Seeing a New World and Making Movies in DNA) and, as one of the hottest potatoes in science, the subject of fierce feuding over legal rights, who did what and who’s going to get a Nobel Prize. Yes, scientists do squabbling as well as anyone when the stakes are high. Nifty though CRISPR/Cas9 is, it has not worked well in stem cells — these are the cells that can keep on making more of themselves and can turn themselves in other types of cell (i.e., differentiate — which is why they’re sometimes called pluripotent stem cells). And that’s a bit of a stumbling block because, if you want to correct a genetic disease by replacing a defective gene with one that’s OK, stem cells are a very attractive target. Robert Ihry and colleagues at the Novartis Institutes for Biomedical Research got over this problem by modifying the Cas9 DNA construct so that it was incorporated into over 80% of stem cells and, moreover, they could switch it on by the addition of a drug. Turning on the enzyme Cas9 to make double-strand breaks in DNA in such a high proportion of cells revealed very clearly that this killed most of them. When cells start dying the prime suspect is always P53, a so-called tumour suppressor gene, switched on in response to DNA damage. The p53 protein can activate a programme of cell suicide if the DNA cannot be adequately repaired, thereby preventing the propagation of mutations and the development of cancer. Sure enough, Ihry et al. showed that in stem cells a single cut is enough to turn on P53 — in other words, these cells are extremely sensitive to DNA damage. Gene editing by Cas9 turns on P53 expression. Left: control cells with no activation of double strand DNA breaks; right: P53 expression (green fluorescence) several days after switching on expression of the Cas9 enzyme. Scale bar = 100 micrometers. From Ihry et al., 2018. In a corresponding study Emma Haapaniemi and colleagues from the Karolinska Institute and the University of Cambridge, using a different type of cell (a mutated line that keeps on proliferating), showed that blocking P53 (hence preventing the damage response) improves the efficiency of genome editing. Good if you want precision genome editing by risky as it leaves the cell vulnerable to tumour-promoting mutations. As ever, “Let the buyer beware” and this certainly isn’t a suggestion that you get on the line to your stockbroker. These results may have hit share prices but they really aren’t a surprise. What would you expect when you charge uninvited into a cell with a molecular bomb — albeit one as smart as CRISPR/Cas9. The cell responds to the DNA damage as it’s evolved to do — and we’ve known for a long time that P53 activation is exquisitely sensitive: one double-strand break in DNA is enough to turn it on. If the damage can’t be repaired P53’s job is to drive the cell to suicide — a perfect system to prevent mutations accumulating that might lead to cancer. The high sensitivity of stem cells may have evolved because they can develop into every type of cell — thus any fault could be very serious for the organism. It’s nearly 40 years since P53 was discovered but for all the effort (over 45,000 research papers with P53 in the title) we’re still remarkably ignorant of how this “Guardian of the Genome” really works. By comparison gene editing, and CRISPR/Cas9 in particular, is in its infancy. It’s a wonderful technique and it may yet be possible to get round the problem of the DNA damage response. It may even turn out that DNA can be edited without making double strand breaks. So maybe don’t rush to buy gene therapy shares — or to sell them. As the Harvard geneticist George Church put it “The stock market isn’t a reflection of the future.” Mind you, as a founder of Editas Medicine he’d certainly hope not. Ihry, R.J. et al. (2018). p53 inhibits CRISPR–Cas9 engineering in human pluripotent stem cells. Nature Medicine, 1–8. Haapaniemi, E. et al. (2018). CRISPR–Cas9 genome editing induces a p53-mediated DNA damage response. Nature Medicine (2018) 11 June 2018. It certainly is for Judy Perkins, a lady from Florida, who is the subject of a research paper published last week in the journal Nature Medicine by Nikolaos Zacharakis, Steven Rosenberg and their colleagues at the National Cancer Institute in Bethesda, Maryland. Having reached a point where she was enduring pain and facing death from metastatic breast cancer, the paper notes that she has undergone “complete durable regression … now ongoing for over 22 months.” Wow! Hard to even begin to imagine how she must feel — or, for that matter, the team that engineered this outcome. Well, it’s a very good example of what I do tend to go on about in these pages — namely that science is almost never about ‘ground-breaking breakthroughs’ or ‘Eureka’ moments. It creeps along in tiny steps, sideways, backwards and sometimes even forwards. You may recall that in Self Help – Part 2, talking about ‘personalized medicine’, we described how in one version of cancer immunotherapy a sample of a patient’s white blood cells (T lymphocytes) is grown in the lab. This is a way of either getting more immune cells that can target the patient’s tumour or of being able to modify the cells by genetic engineering. One approach is to engineer cells to make receptors on their surface that target them to the tumour cell surface. Put these cells back into the patient and, with luck, you get better tumour cell killing. An extra step (Gosh! Wonderful GOSH) enabled novel genes to be engineered into the white cells. The Shape of Things to Come? took a further small step when DNA sequencing was used to identify mutations that gave rise to new proteins in tumour cells (called tumour-associated antigens or ‘neoantigens’ — molecular flags on the cell surface that can provoke an immune response – i.e., the host makes antibody proteins that react with (stick to) the antigens). Charlie Swanton and his colleagues from University College London and Cancer Research UK used this method for two samples of lung cancer, growing them in the lab to expand the population and testing how good these tumour-infiltrating cells were at recognizing the abnormal proteins (neo-antigens) on cancer cells. Now Zacharakis & Friends followed this lead: they sequenced DNA from the tumour tissue to pinpoint the main mutations and screened the immune cells they’d grown in the lab to find which sub-populations were best at attacking the tumour cells. Expand those cells, infuse into the patient and keep your fingers crossed. Adoptive cell transfer. This is the scheme from Self Help – Part 2 with the extra step (A) of sequencing the breast tumour. Four mutant proteins were found and tumour-infiltrating lymphocytes reactive against these mutant versions were identified, expanded in culture and infused into the patient. The last step with the fingers was important because there’s almost always an element of luck in these things. For example, a patient may not make enough T lymphocytes to obtain an effective inoculum. But, regardless of the limitations, it’s what scientists call ‘proof-of-principle’. If it works once it’ll work again. It’s just a matter of slogging away at the fine details. For Judy Perkins, of course, it’s about getting on with a life she’d prepared to leave — and perhaps, once in while, glancing in awe at a Nature Medicine paper that does not mention her by name but secures her own little niche in the history of cancer therapy. McGranahan et al. (2016). Clonal neoantigens elicit T cell immunoreactivity and sensitivity to immune checkpoint blockade. Science 10.1126/science.aaf490 (2016). Zacharakis, N. et al. (2018). Immune recognition of somatic mutations leading to complete durable regression in metastatic breast cancer. Nature Medicine 04 June 2018. In the pages of this blog we’ve often highlighted the power of fluorescent tags to track molecules and see what they’re up to. It’s a method largely pioneered by the late Roger Tsien and it has revolutionized cell biology over the last 20 years. In parallel with molecular tagging has come genetic engineering that permits novel genes, usually carried by viruses, to be introduced to cells and animals. As we saw in Gosh! Wonderful GOSH and Blowing Up Cancer, various ‘virotherapy’ approaches have been used with some success to treat leukemias and skin cancers and a trial is underway in China treating metastatic non-small cell lung cancer. A major aim of genetic engineering is to be able to control the expression of novel genes (i.e. protein production from the encoding DNA sequence) that have been introduced into an animal — in the jargon, to ‘switch’ on or off at will. That can be done but only by administering a drug or some other regulator, either in drinking water, by injection or squirting directly into the lungs. An ideal would be something that’s more controlled and less invasive. How about shining a light on the relevant spot?! That may sound as though we’re veering towards science fiction but reflect for a moment that every animal with vision, however rudimentary, sees by transforming light entering the eyes into electrical signals that the brain turns into a picture of the world around them. This relies on photoreceptor proteins that span the membranes of retinal cells. How vision works. Light passes through the lens and falls on the retina at the back of the eye. 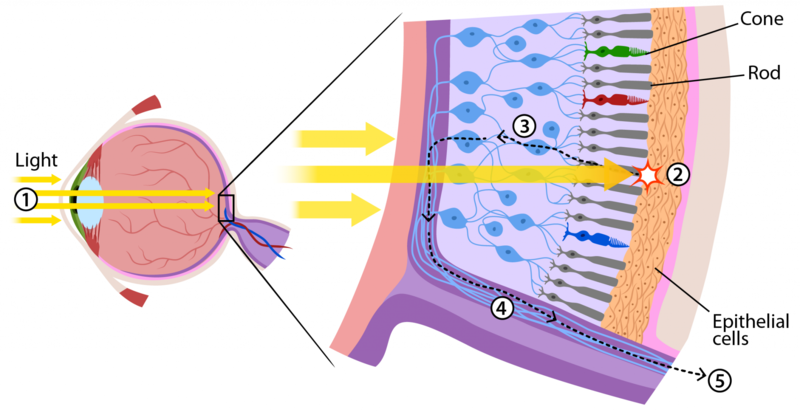 The photoreceptor cells it activates are rod cells (that respond to low light levels — there’s about 100 million of them) and cone cells (stimulated by bright light). Sitting across the membranes of these cells are photoreceptor proteins — rhodopsin in rods and photopsin in cones. Photoreceptor proteins change shape when light falls on them — the driver for this being a small chemical attached to the proteins called retinal, one of the many forms of vitamin A. This shape change allows the proteins to ‘talk’ to the inside of the cell, i.e. to interact with other proteins to switch on enzymes and change the level of ions (sodium and calcium). The upshot is that the signal is passed through neural cells in the optic nerve to the brain where the incoming light signals are processed into the images that we perceive. © Arizona Board of Regents / ASU Ask A Biologist. The seemingly far-fetched notion of controlling genes by light was floated by Francis Crick in 1999. The field was launched in 2002 by Boris Zemelman and Gero Miesenböck who engineered neurons to express one form of rhodopsin. This gave birth to the subject of optogenetics — using light to control cells in living tissues that have been genetically modified to express light-sensitive ion channels such as rhodopsin. By 2010 optogenetics had advanced to being the ‘Method of the Year’ according to the research journal Nature Methods. One of the most dramatic demonstrations of the power of optogenetics has come from Robert Kittel and colleagues in Würzburg and Göttingen who made a mutant form of a protein called channelrhodopsin-1 (found in green algae) and expressed it in fruit flies (Drosophila melanogaster). The mutant protein (ChR2-XXL) carries very large photocurrents of ions (critically sodium and calcium) with the result that photostimulation can drastically change the behaviour of freely moving flies. Light-induced stimulation of motor neurons in adult flies expressing a mutant form of rhodopsin ChR2-XXL. Click to run movie. Left hand tube: Activation of ChR2-XXL in motor neurons with white light LEDs caused reversible immobilization of adult flies. In contrast (right hand tube) flies expressing normal (wild-type) channelrhodopsin-2 showed no response. From Dawydow et al., 2014. 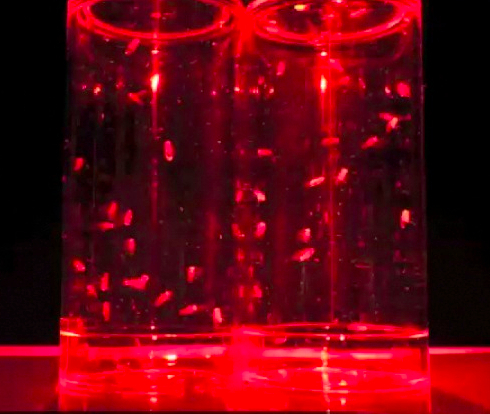 Other optogenetic experiments on flies can be viewed on You Tube, e.g., the TED talk of Gero Miesenböck and the Manchester Fly Facility video of fly maggots, engineered to have a channel protein (channelrhodopsin) in their neurons, responding to blue light. This is stunning science and it’s opened a new vista in neurobiology. But what about the things we’re concerned with in these pages — treating diseases like diabetes and cancer? Scheme showing how genetic engineering can make the release of insulin from cells controllable by light. Normally cells of the pancreas (beta cells) take up glucose when its level in the circulation rises (via a glucose transporter protein). The rise in glucose triggers ATP production in the cell. This in turn causes potassium channels in the membrane to close (called depolarization) and this opens calcium channels. 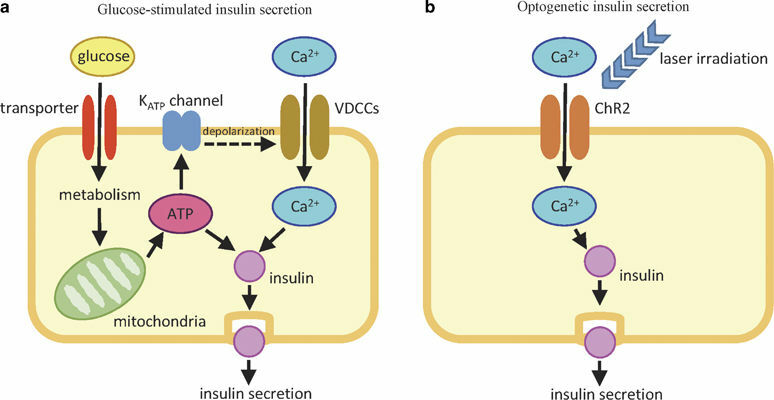 The increase in calcium in the cell drives insulin secretion. From Kushibiki et al., 2015. The left-hand scheme above shows how glucose triggers the pancreas to produce the hormone insulin. Diabetes occurs when either the pancreas doesn’t make enough insulin or when cells of the body don’t respond properly to insulin by taking up glucose. As a first step to see whether optogenetic regulation of calcium levels in pancreatic cells could trigger insulin release, Toshihiro Kushibiki and colleagues at the National Defense Medical College in Saitama, Japan engineered the channelrhodopsin-1 protein into mouse cells and hit them with laser light of the appropriate frequency. An hour after a short burst of light (a few seconds) the insulin levels had doubled. The photo below shows a clump of these cells: the nuclei are blue and the channel protein (yellow) can be seen sitting across the cell membranes. 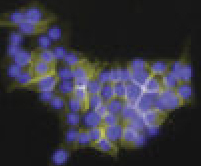 Cells expressing a fluorescently tagged channelrhodopsin protein (yellow). Nuclei are blue. From Kushibiki et al., 2015. To show that this could work in animals they suspended the engineered cells in a gel and inoculated blobs of the goo under the skin of diabetic mice. Laser burst again: blood glucose levels fell and they showed this was due to the irradiated, implanted cells producing insulin. Those brilliant results highlighted the potential of optogenetic technology as a completely novel approach to a disease that afflicts over 300 million people worldwide. Scheme showing a Smartphone can be used to regulate the release of insulin from engineered cells implanted in a mouse with diabetes. The key events in the cell are that the light-activated receptor turns on an enzyme (BphS) that in turn controls a transcription regulator (FRTA) that binds to a DNA construct to switch on the Gene Of Interest (GOI) — in this case encoding insulin. (shGLP1, short human glucagon-like peptide 1, is a hormone that has the opposite effect to insulin). From Shao et al., 2017. In a remarkable confluence of technologies Jiawei Shao and colleagues from a number of institutes in Shanghai, including the Shanghai Academy of Spaceflight Technology, and from ETH Zürich have recently published work that takes the application of optogenetics well and truly into the twenty-first century. They figured that, as these days nearly everyone lives with their smartphone, the world could use a diabetes app. Essentially they designed a home server SmartController to process wireless signals so that a smartphone could control insulin production by cells in gel capsules implanted in mice. There are differences in the genetic engineering of these cells from those used by Kushibiki’s group but the critical point is unchanged: laser light stimulates insulin release. The capsules carry wirelessly powered LEDs. The only other thing needed is to know glucose levels. Because mice are only little and they’ve already got their gel capsule, rather than implanting a monitor they took a drop of blood from the tail and used a glucometer. However, looking ahead to human applications, continuous glucose monitors are now available that, placed under the skin, can transmit a radio signal to the controller and, ultimately, it will be possible for the gel capsules to have a built-in battery plus glucose sensor and the whole thing could work automatically. Any chance of illuminating cancer? This science is so breathtaking it seems cheeky to ask but, well, I’d say ‘yes but not just yet.’ So long as the ‘drug’ you wish to use can be made biologically (i.e. from DNA by the machinery of the cell), rather than by chemical synthesis, Shao’s Smartphone set-up can readily be adapted to deliver anti-cancer drugs. This might be hugely preferable to the procedures currently in use and would offer an additional advantage by administering drugs in short bursts of lower concentration — a regimen that in some mouse cancer models at least is more effective. Dawydow, A., Kittel, R.J. et al., 2014. Channelrhodopsin-2–XXL, a powerful optogenetic tool for low-light applications. PNAS 111, 13972-13977. Kushibiki et al., (2015). Optogenetic control of insulin secretion by pancreatic beta-cells in vitro and in vivo. Gene Therapy 22, 553-559. Shao, J. et al., 2017. Smartphone-controlled optogenetically engineered cells enable semiautomatic glucose homeostasis in diabetic mice. Science Translational Medicine 9, Issue 387, eaal2298.